Summer in Jerusalem means visits from friends – Hello Cheryl, Hello Wendy! – and parched countryside on daily walks with the dogs. But there were unexpected visitors on our walk this morning. Down by a beautiful nineteenth century monastery, I ate three figs off their tree – the best fig tree in Ein Karem – and then opened a gate that’s usually locked. It was thrilling to walk there, in the shade of the Monastery’s thick walls, until who should find us but a trio of donkeys. The first two, the brown one, then the white one, were friendly. The third one, who looked younger, with beautiful markings, was more shy. It made my morning, because the last lot of donkeys were stolen from here, and I didn't know they'd been replaced. The dogs kept their distance, though. In fact, two disappeared completely. Only Mia, was brave enough to show her face – but kept far enough away to allow her to bolt, if necessary. Lots of exciting news this week. First and foremost, the Cookbook we have been diligently working on is in the home stretch. We’ve settled on a name we all like – still under wraps for the moment – and we are going to begin a crowdfunding campaign to pay for its publication. We are in the countdown to that now. It will start in about two months time, so am asking all of you who support this project to please sign up to our email list for updates, as well as early bird discounts on the book. And please sign up any friends you think will be interested because they love food, cooking or history, and will want to be part of this too. This week we have a wonderful recipe and story. We’re making Lokshen kugel. Pasta, usually egg noodles, cooked with white cheese and – because this is the sweet version – dried fruit. Jewish comfort food. The recipe comes from Mindy Weisel, and she has it from her mother, Lili Deutsch. It’s Mindy’s story we’re telling, in a slight change from our usual format, or perhaps an expansion of it, giving a voice to the daughter of Survivors, seeing the experience through her eyes. Mindy Weisel was one of the first babies born in Bergen-Belsen after World War Two, “and not as my mother told me for years the first baby born there," she says. Bergen-Belsen had been a concentration camp but it was a DP camp by the time Mindy was born there. Her parents were two young cousins, Amram and Lili Deutsch, both survivors of the death camp of Auschwitz. The author Elie Wiesel was also a cousin. “His father and my grandmother were brother and sister,” Mindy says. Both Elie Wiesel and Mindy’s father Amram came from the town of Sighet in Romania. Amram and Lili Deutsch with their daughter Mindy, around 1947 when Mindy was 18 months old, in the DP camp Bergen-Belsen. in 1949, they migrated to the United States. Both Mindy's parents were Survivors of Auschwitz. 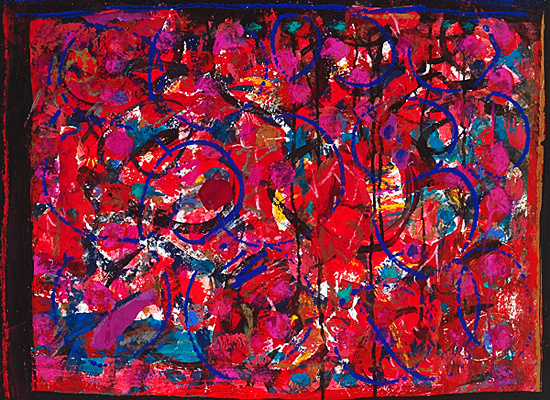 Mindy is an American abstract artist, whose brightly-coloured paintings and mixed-media works hang in galleries across the US and Europe. She moves between the US where she has spent most of her life and Israel, where one of her daughters lives. I interviewed her in Jerusalem, when she cooked with a very sweet grandson, Ely. Examples of Mindy's striking colourful art work, below. Mindy Weisel’s art reflects her parents’ experience as much as her own. “Like most survivors' daughters, while I was growing up, and even well into my twenties, I didn't know how I really felt about anything. I knew how my parents felt, but I was not allowed the normal range of emotions,” says Mindy. “If I was sad or anxious, it made them sad and anxious. And, after all, what was there for me to be sad about anyway? I had not been in Auschwitz. I did not know what it was to be cold, hungry, or devastated. All my feelings not related to Auschwitz were naarish (foolish)," she says. When Mindy could no longer bury her feelings, she became an artist. But for three decades, her parents' experiences still dominated her art. In a series of paintings, the letter and numbers A 3146 appear over and over. That was the number tattooed on her father's arm at Auschwitz. Many of her works shimmer with cobalt blue because the first dress her mother was given when she reached America was blue. There's also often a thin line of red, in reference to her mother's blood type. "My mother had no number tattooed on her arm in Auschwitz because she was not chosen to live," Mindy says. "But she had a rare blood type and Dr Mengele, who was conducting vile medical experiments, wanted to test her blood. So, each day they came and brought a tiny bit of soup to keep her alive until the following blood test. For a year she thought that every day was her last. She was 21," says Mindy. Mindy’s mother Lili never told her that; Mindy only learnt about it after her mother’s death. Mindy’s art grapples with what wasn’t said as much as what was, with absence as well as presence. Mindy, aged about 4 years old. Mindy says her father calls her every Friday from Los Angles, where he lives in a tight-knit community of Holocaust survivors. “He lets me know who is no longer with us since we last spoke. My first thought is always -- another one gone! Another whose marvellous European Yiddish accent we will never hear again and whose like will never be known again," says Mindy. “I experienced the death of the ‘Last Survivor’ when my mother died. She was the only woman in her entire family who had survived the war. I felt that, with her death, the threads tying me to the family she kept alive for us broke," says Mindy, saluting both her mother's great grief and her great courage. “The last thing my mother said to me before she died, was 'Mindeleh, don't let it die with me'. For her ‘it’ was about family, history, culture, belief and experiences. What I was left with, however, was an existential emptiness. How does one remember what she herself couldn't really express?" Mindy asks, as her mother was one of the Survivors who did not speak about their wartime experiences. “My mother spoke mainly of the beauty that existed before the War: stories of her elegant home, her generous parents, her brothers and sisters who were killed. And when she cried, it was one tear at a time. I do believe that had she ever allowed herself to weep she would never have stopped,” Mindy reflects on a crisp autumn day in Jerusalem. She pauses before finishing. Mindy, now a mother of three daughters and grandmother of six boys and girls, still cooks the Hungarian dishes she learnt from her mother. Mindy’s father worked as a baker, so there was no need to bake at home, and Mindy still doesn’t. “I never made blintzes or pancakes because they would not be as good as my mother's. But my daughter does. And she makes cholent like my mother did. It seems to have skipped a generation," says Mindy. Mindy with her grandson Ely, one of her 6 grandchildren. There’s no doubt that across cultures, macaroni and cheese are a Power Couple. This dish is the Jewish version. In South Africa, it was so identified with the Jewish community that Jewish girls were known as ‘kugels’. It’s unusual because it's a sweet main course, perfect for lunch or a light weeknight dinner. Mindy has adapted her mother Lili’s recipe to reduce fat and sugar. Grated rind of half an orange or lemon, with its juice. 1. Preheat oven to 200 C /190 C fan forced. Prepare a medium-sized baking dish, made of over proof glass. Mindy uses Pyrex. 2. Boil noodles for 5-8 minutes, you want them a bit firm, not entirely soft, as you are going to bake them as well. While the noodles are cooking, mix the eggs and cheese with the spices in a bowl. Mindy uses a spoon. When it's combined, add the juice and mix. Add jam or marmalade, if using. Fold in the fruit, nuts and zest. 3. Put 4 tablespoons butter into the baking dish and put it in the warm oven till it melts. “Don’t talk to anyone while you are doing this. This is the one step in this easy recipe that you can mess up. If you burn the butter, you’ll have to start again,” Mindy says. 4. When the butter has melted, remove from oven and pour into the bowl with the cheese mixture. Add the drained noodles. Pour everything back into the dish, which has now been “buttered” and bake till crispy on top (usually 30-35 minutes). 5. Serve hot or cold. Can be prepared 2-3 days ahead. Saw a quote that made me smile this week, from American writer, humourist, novelist and foodie Calvin Trillin. It kind of reminds me of kugel. He’s a man of the generation of the Food is Love grandmothers, and family, travel and food are themes in his work, so he fits right in here. He's also a son of a Jewish grocer lucky to have been born in the US in 1935, rather than in Europe or Russia. Calvin Trillin was devoted to his wife, Alice, still in love with her after years of marriage, as Mindy’s father Amram was with Lili. Alice featured in all Trillin's work; he wrote for her, he said. There’s something deeply moving about a man who loves his wife so much. Trillin wrote a beautiful New Yorker piece after Alice's death, full of delicious descriptions. He remembers all the way back to when they met, including him trying to impress her at a party. This will resonate with many funny men I know. At the end you’re in love with Alice too. In fact, you love them both. It’s a great article to read while eating kugel.